No 5 from Mary's 'Human Trafficking' series, ink and watercolour on paper. 45 cm x 30 cm. Mary : "I have recently made a series of drawings in an attempt to raise awareness of the plight of trafficked people. This drawing shows a child. This child could be a boy or a girl. Unfortunately there has always been a demand for babies and children for sale. At best, a child might be sold to a childless couple. At worst they could be sold as slave labour or sold into prostitution. Unaccompanied child- refugees are particularly vulnerable to trafficking. Very young children cannot speak for themselves to ask for help, but older children may not be able to make themselves understood in a foreign country either. 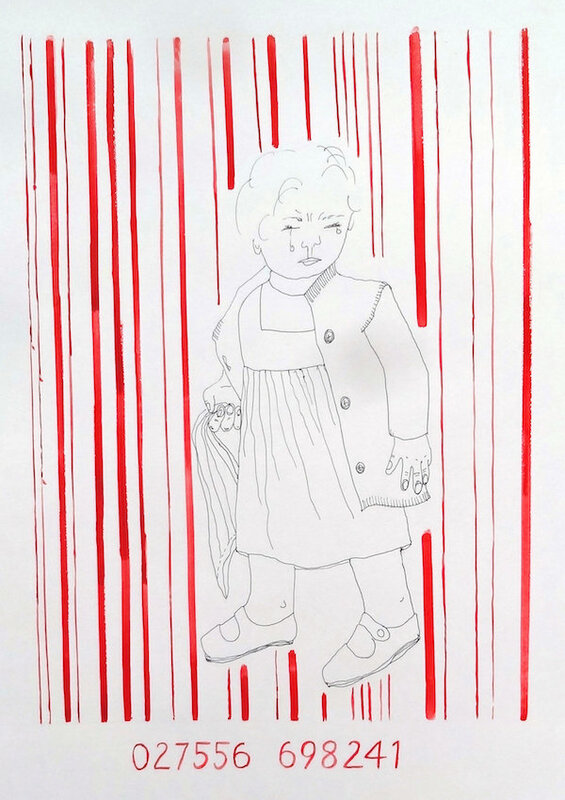 The ‘bar-code’ in the background of the drawing shows that the child is being treated as a commodity for sale."